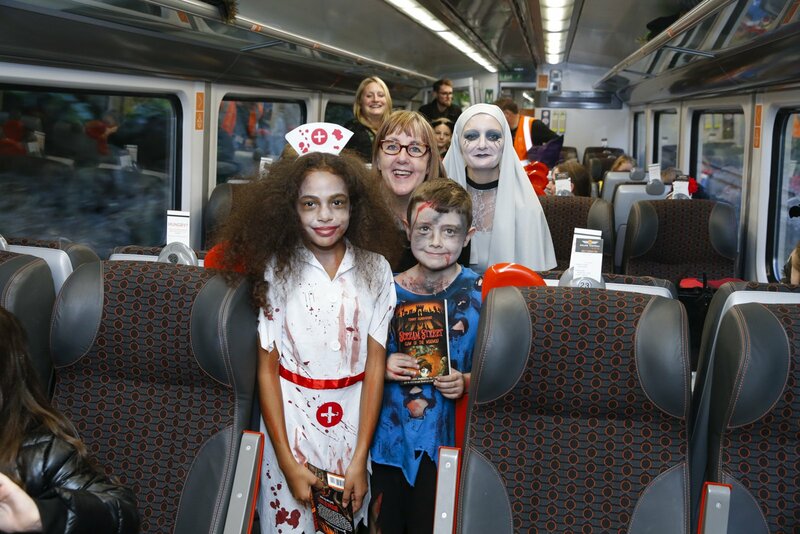 All wearing their finest, scary Halloween costumes, the youngsters were brave enough to enter the spooky train carriage that was set to take them from Brighouse to Doncaster on Wednesday 24 October. Not only were they brave enough to enter, they showed they weren’t scared to tell their own ghost stories! After listening to Author and Town Foundation Patron Helena Pielichaty, the children carried on having a spooktacular day by writing their own scary stories! The children brought out their inner spirits and created their very own ghost, before deciding which room of a house was haunted and what happened if you entered that room. As the train arrived back in Brighouse the children were given a treat, not a trick, which was a Town Foundation drawstring bag containing a water bottle, a story book written by Helena, a happy meal toy which was donated from McDonalds on Leeds Road in Huddersfield and a Grand Central train story book. “This was definitely a great way to start Halloween! The children were thoroughly engaged throughout the journey and showed real creative flair in their stories. “Having Helena (Pielichaty) on board was excellent, she really knows how to engage with the children and bring the best out of them. “I would like to thank Grand Central for providing us with free transport, as without them it wouldn’t have been possible to put this event on for the school children. “The spooky train went down a treat! With help from our colleagues at the Huddersfield Town Foundation, we managed to deliver what was an excellently creepy experience for our young guests, half of whom, had never even travelled by rail before, which made the day even more special. “I’d just like to thank our partners at the Foundation and all of the staff and children from Healey School who were all an absolute pleasure to have on board.